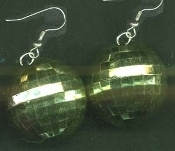 Funky HUGE DISCO BALL EARRINGS - Peridot GREEN - Extra-Large Novelty Dance Club Party Retro DJ Disco Costume Jewelry - BIG Metallic Hard Hollow Plastic sphere dimensional charm, approx. 1.5-inch (3.75cm) diameter balls. Great party celebration favors for Prom, New Year's Eve, Mardi Gras, American Idol, Star, Empire, Dancing with the Stars, BeeGees or Saturday Night Fever fans!